Genus native of the region of Samaipata, in Bolivia, hence the name. Monotypic genus of treelike, columnar plants, with a trunk and heavily branched. 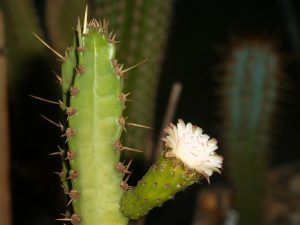 Stems cylindrical, erect, not segmented, dark green, up to 4-6 well-defined ribs, with brown areoles well-separated and regularly arranged. Usually 5 spines, undifferentiated, short, subulate, one of them longer than the others and pointing downwards. Flowers nocturnal, but remaining open during the next day, numerous, self-fertile, appearing often far under the apex, funnel-shaped with a long tube covered with scales, hairs and bristles, white, pollinated by bats (Anoura caudifer, A. geoffroyi, Glossophaga soricina) and hummingbirds. Fruits globose, truncate and tuberculate, pink-red with longitudinal dehiscence, exposing a lively orange pulp, floral remains persistent, dispersal ornithophilous. Seeds ovate, dark brown, shiny, with little marked relief. The monotypic genus Samaipaticereus grows endemically in the province of Santa Cruz in Bolivia, on rocky steep slopes, always in quebradas (valleys), from 1150 m up to 2500 m in altitude.